Facebook founder Mark Zuckerberg seems to be enjoying his visit to Nigeria. He was photgraphed jogging along Lekki-Ikoyi link bridge in Lagos on Wednesday morning. 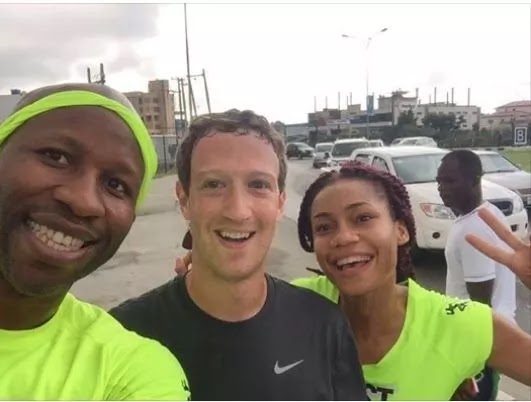 The billionaire took selfies with some excited fans after the jog, according Nigerian media reports. Zuckerberg is in Nigeria to meet with tech developers and entrepreneurs there. His first visit to Sub-Saharan Africa, the seventh richest man in the world will also partner Cool Link to launch free Wifi in Lagos. Facebook recently launched Free Basics in the country. The Chan-Zuckerberg Initiative has also invested $24 million in Andela, which aims to develop the next generation of software engineers in Africa.